What kind of developers have the peanuts to rip off Jackie Chan not once, but twice, at the same time? Taito have the peanuts, that's who. This image is from Silent Dragon, a side-scroller Taito released in 1992. The blue dude on the left may look familiar to anyone who's seen Jackie Chan's awesome Big Brawl, because the pose is lifted straight from the movie's poster. The gentleman on the right? He's not just bearing Chan's likeness, he's copying another pose of his, this time from The Jackie Chan Digest, a soundtrack compilation from his early movies released in 1983. 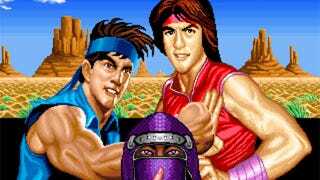 You could scold Taito for failing to come up with their own martial arts poses (and faces! ), but really, in some ways it's an improvement. Chan wasn't brave enough to wear those massive headbands, and Silent Dragon was all the better for them.